Be Prepared: Before you bring your new puppy home, consider what you will need. We have a basic puppy checklist on OUR STORE page. Here are some suggestions: Purchase a adequate sized wire puppy crate, a harness or leash; a collar; shampoo designed for puppies; grooming brush; food/water dishes which will be short enough for your puppy to adequately eat and drink from; bottled water since water differs from one part of the country to the other; exercise playpen to keep your puppy safe; toys that are durable and cannot be chewed apart; doggie toothbrush and toothpaste to maintain a healthy smile. Never give your puppy or dog RAWHIDE chews! Please DO NOT leave toys inside the puppy crate with them unsupervised as these are choking hazards. ROPE TOYS are very dangerous! the puppy can eat the string and it can get lodge inside the digestive system and cause a blockage. Never leave ROPE type toys unsupervised with your puppy. For recommened toys, crates, food and nurtients please visit OUR PUPPY STORE. Recommended Puppy Food: We feed all of our dogs and puppies high quality Diamond Naturals Brand Pet Foods. Your puppy will come with a small starter packet of food. Feel free to change to another high quality brand dry food but it is VERY important to gradually introduce the new food to your puppy by adding a mixture of the food your puppy comes home with and the new food you choose for your puppy. NOTE: your puppy should always have dry food and water set out for him or her anytime during the day or night. We recommend feeding your new puppy 3 times a day. Mix canned puppy food with a high quality dry puppy food such as: Diamond Naturals puppy food, 4Health puppy food, Chicken Soup for Puppies by Diamond, Taste of the Wild, Blue Buffalo, Royal Canin, or another high quality of food source formulated for the high energy and nutritional need of your new puppy. Keep some Microbiotic to help stimulate the immune system and keep your puppy's health in tip-top shape, such as: ProBios, Benebac, or FasTrack. We use PROBIOS probiotics suppliments in each meal for our puppies (you can find this product in our online store). Puppies love to jump from couches, etc. but this can injure their knees. Discourage any type of jumping to protect their knees and hips. Further, collars can cause collapsing trachea in small breed dogs--use a harness instead. Your veterinarian is a good source of information concerning a number of topics with regards to the newest member of your family. Make sure you discuss all your questions with your veterinarian. It is Very Important to keep the puppy up-to-date on his vaccines. Your puppy will go home with age appropriate vaccines and it is your responsibility to follow-up with your vet for the remaining series of vaccines. At your initial health check, be sure to bring along your puppies health records that we have provided you with and have your veterinarian schedule future appointments to maintain a current vaccination schedule. Puppies are born with special immunities passed to them by their mother, but that last for a short period of time and ceases at different ages for different puppies. Hypoglycemia: low blood sugar, is a disorder that occurs mainly in small breed puppies and is often caused by stress and can occur without warning. It might appear after the puppy has become exhausted from playing, or misses a meal, chills or has a digestive upset. These upsets place an added strain on its energy levels and bring on the symptoms of lethargic, collapse or even what appear to be seizures. It is a real threat to these little guys, so watch for your puppy becoming too tired or droopy. The first signs of listlessness or depression are usually followed by muscular weakness, tremors and later convulsions, coma and even death. The puppy may appear depressed or may be weak, wobbly and jerky, or found to be in a comatose state. If your puppy has any symptoms that even appear to be those of hypoglycemia, you must act fast. If the puppy is awake, give it Karo syrup or Nutri-cal by mouth. You should see improvements within 30 minutes. If no improvements appear, you must get them to a veterinarian. If the puppy is unconscious, it should be taken at once. To prevent Hypoglycemia follow this advice: allow only 20 minutes or less of play at one time, followed by a good rest. Do not allow the puppy to overtire. Supervise the interactions between the puppy and children. Keep your puppy warm, a nice heating pad on low is great to keep it from becoming chilled. Your puppy needs to eat at least every 4 hours, more often if it is small. Freshly cooked chicken along with a plain or vanilla yogurt or small curd cottage cheese is also a helpful food to keep them eating. Give a small amount of Nutri-cal or Karo syrup each morning and night for the first couple of days to prevent the low blood sugar that can come with the excitement and stress of going to a new home. 1) Don't leave your puppy unattended for extended lengths of time, until your puppy has totally acclimated himself/herself to its new home. Long periods of time left alone in a new, strange environment may cause anxiety and additional stress. You will want to be with your baby as much as possible in the first few weeks. If you have to be away from home for more than 4 hours, such as going to work, then please consider a pet sitter or family member to come in to your home and watch your new puppy for you. They will need to pay special attention to feeding schedules, access to fresh water, food, room temperatures, limited play times, and periodic nutri-cal supplements. 2) Prepare a comfortable WARM place for your puppy to consider its own home. You may want to invest in a heating pad (for smaller breeds); set it on LOW with a baby blanket or towel on top of it; and make sure puppy cannot get to the cord. You may only need a little additional warmth for several days. A nice warm bed and blankets are a nice addition so they can be cozy. 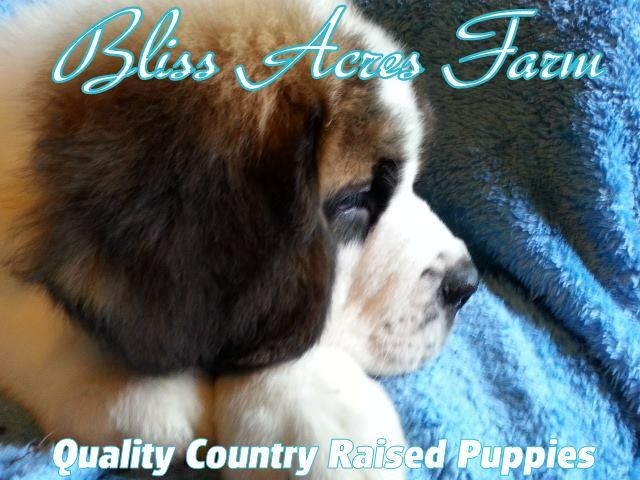 For larger breed Saint Bernard puppies you will find that they prefer the cooler temperatures and often enjoy the air conditioner and fans to be comfortable. 3) Always have food and water sitting out for your puppy to graze on anytime. For the first week or so, make sure your puppy gets whatever he/she wants to eat. Do not be afraid to offer small meals several times a day to your puppy. If your puppy won't eat the food, you can try feeding canned puppy food, slightly warmed, and you can offer it on the tip of your finger to the puppy while holding her. This usually works for the most spoiled puppies. There may be a time period where your puppy will not want to eat at all, but don't let this happen. If need be, finger feed your puppy, try different foods, and even try Gerber baby food meats if all else fails. Yogurt (all-natural, plain with live cultures) work well, or try offering small curd cottage cheese. We give this to our puppies once every evening, and they love it! Diamond Naturals canned puppy food, Diamond Brand Chicken Soup for Puppies canned food, Nutro small breed canned puppy food, 4Health canned puppy food, ProPlan canned puppy food,, or Pedigree for Puppies seems to be their favorites. There will come a time when puppy will begin to eat more and more of his/her hard kibble, but for a period of time you need to "baby" your puppy. Always make sure your puppy is eating about every 3-4 hours during the day. Always feed your puppy before bedtime too, and give a couple fingertip doses of Nutri-cal before bedtime. We do NOT recommend feeding your new puppy a raw meat diet. This is controversial with many breeders, but we do not support this method of nutrition for puppies. If interested in feeding a raw food diet, please research first and introduce to your puppy after he/she is 6 months old. 4) Nutri-cal vitamin supplement will also encourage your puppy's appetite, help raise sugar level, and increase energy. For smaller breeds, make sure you are using your Nutri-cal: a.m., noon, p.m. and before bedtime. If need be, increase your supplement to more times during the day if puppy is not eating or drinking well. We also recommend that you also have a good Microbiotic for your puppy to help stimulate and boost its immune system, such as: Benebac or FasTrack. 5) Water -- make sure it is bottled water for the 1st 2 weeks and then gradually wean your puppy off the bottled water onto the water you have in your home. Water can be a definite detriment to your puppy's system when changing from one water source to the next. 6) Play time and Rest time: Make sure you spend lots of quality time with your baby. Play should be limited to 10-15 minutes for the small breeds and 30 mins for large breeds. A worn out puppy will quickly crash with hypoglycemia as it has exhausted its energy supply. Make sure you allow your puppy to have plenty of rest. Babies usually eat and sleep during the first 3 months of life -- your puppy is no different. It will require plenty of food/water and plenty of rest. 7) Hypoglycemia -- should your puppy show signs of hypoglycemia: lethargic, loss of appetite, droopy, tail tucked, drooling, limp, staggered walk, won't play, or seizure fits. Rub some Karo syrup to the gums, wait for puppy to respond and if able, lick the Nutri-cal. Give several Nutri-cal fingertip doses until puppy is regaining a normal composure (about every 10-15 mins if puppy is not responding well). If the puppy is in a drooling, limp or seizure state, you should get the puppy to the Vet quickly and bring the Nutri-cal with you and rub it on to the gums and tongue during travel. However, if the puppy is eating, drinking and you are following the above recommendations, your puppy should not ever end up in this state. Please contact us if you have any questions. 8) If the puppy needs veterinarian attention, please make sure you find a qualified Vet that specializes in your breed. Small breeds such as Teacup Chihuahua's and Giant breeds such a St. Bernard's have very different needs. We would hope you can find one that has a length of experience with tiny teacup puppies or giant breeds such as St. Bernard's or Great Danes. There are many veterinarians who do not know the first thing about these teacup Chihuahua puppies. These tiny ones are a whole new situation unlike medium or large breed puppies. We have been raising puppies for many years, as well as gaining information from fellow professional breeders who have dealt with toys, t-cups, and giant large breeds for many more years than us. Our instructions for you and your baby, have been researched and practiced for many years. One thing is you should have your vet check for coccidiosis if our puppy has been feeling ill or weak. Your puppy will more than likely break with coccidiosis under hypoglycemia conditions. The trip, new environment, new people, new home, new water source, new everything can cause coccidiosis to break in your puppy. We treat the puppies before they leave with a special formula of Albon and Metronidazole in hopes that the puppy will not experience any healthy issues, but with our tiny tiny ones it may happen anyway. We suggest your vet use Albon as a treatment for at least 7 - 10 days if your puppy contracts Coccidia. We would suggest that your young puppy not remain at the vet's office unless absolutely necessary, because you are introducing your new baby into another new environment, new people, possible bacteria and viruses which adds even more stress and possible infection to your puppy. Ask your vet what you can do to stabilize the puppy and if your vet will show you what procedures to follow to help your puppy regain its health. If your baby can be with you, this will be the best solution. As a new mother, you need to make sure that you consider the proper decisions to alleviate any unwarranted stress as possible. If the vet feels that IVs are necessary, please have them consider SQ method if possible, which would be less stressful. You and your vet will need to make the decisions together. If you puppy is left in the care of the veterinarian and his/her staff, find out if someone will be caring for the baby personally; if food will be spoon-fed or syringe fed to your baby should it not want to eat; visit the location where your baby will be cared for (is it a warm, cozy comfortable place?) Do everything possible to insure your baby gets as good as care as if you were there. Please have your veterinarian and staff feed your puppy A/D along with yogurt if possible; also a good microbiotic such as ProBios, Benebac, or FastTrack is a MUST. Nutri-Cal or Pet Tenic is also very important. This will help your puppy regain its strength and vitality much quicker and keep the digestive system running smoothly. 9) Please email, text or call us if a situation arises. We will do our best to follow through with all the help we can provide to help you and your veterinarian care for your new baby.